Drivin' West - Reno? No, Let's Keep Driving. So the first, and most important, item on the agenda was a safe and timely arrival in Las Vegas. 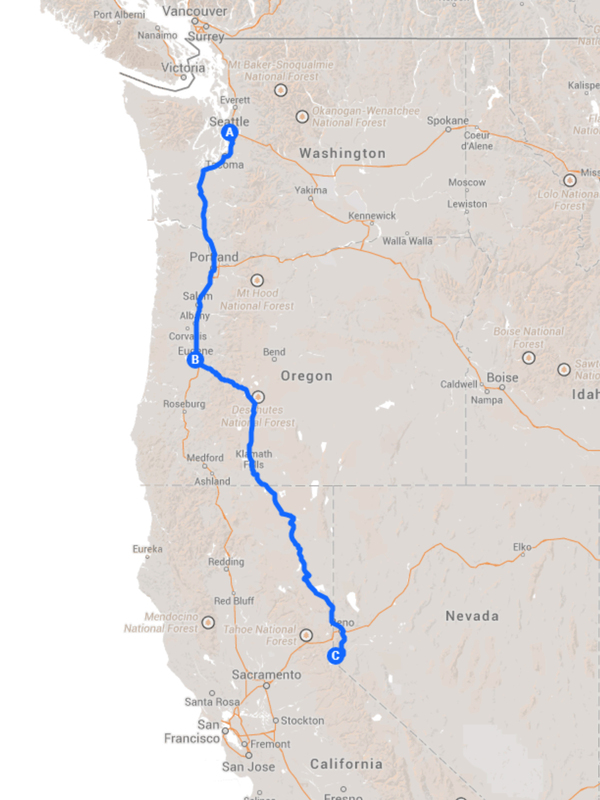 A drive to Reno was about 11.5 hours from Seattle. I was going to make the first leg of the trip a serious no-frills driving day, but shortly after the plans got into the works, I was offered a generous opportunity to stay at the temporary Adanalian mansion on Lake Tahoe. The Adanalians are the family of my coworker, Ryan, and also happen to be clients at the office. We're designing their permanent mansion. Part of the agenda, if I made it to the Adanalians, would include the chance to throw some dice with Pete Adanalian at the Lakeside Inn. This tempting offer added and hour to the total drive, and one doesn't want to arrive too late in case the craps tables are closed, so I decided to hit the road after work, instead of starting the morning after. Now that the car item has been explained, lets get moving. The initial drive down I-5 was relatively uneventful. I made steady progress and could have made more but decided at 10:45pm that I may need to put together a plan for the night. I decided to pull off into the Oaks Grove Rest Stop, get on Priceline, and arrange a place to stay about an hour ahead (a tactic developed during my longer cross country travels). The search indicated my route left dense civilization (with hotels) after Eugene, Oregon, so I settled for the Broadway Inn about 30 minutes out. The next day, I work up early and hit the road. This leg of the trip would take me off the interstate for most of the day. The drive was therapeutic with a mix of rural farmland and forests scattered about and virtually no traffic. I made it a point to ensure my gas tank was near full most of the day per the advice of my coworker, Anne, although the mandatory full service stations feel weird. After driving through the mountains of Oregon, the terrain flattens a bit. Before the California state line lies the small town of Merrill, Oregon which has an enticing CMU drive-thu buiding called the Polar Bear. Signage indicated they have burgers, fries, and, milkshakes and it was about lunch time. The establishment had the potential to serve some mean food, but the end result was average for the the bacon burger and fries. I did find it odd that the fries weren't a little limpy. I wonder if the potato farmers nearby prefer a more raw potatoey texture. I was due to get into Lake Tahoe, technically Glenbrook, at 5:30pm but I wanted to make a small detour to check out the Peppermill. I appreciate how the casino treats the interior with a lot of mirrors and neon. The interior remains good, but portions are slowly being converted into a cheap Caesars Palace theme. In the Caesar Palace wing, the gold was rubbing off the bathroom fixtures and the soap dispensers were silver, but this is Reno! At least they thought of soap dispensers even if they don't match (I have to knock Reno just a little bit). Fortunately, the Peppermill still features video screens throughout the casino floor with worldly landscapes, something all the Peppermill owned locations have, and the world famous Fireside Lounge. At the end of the day, I made it to Glenbrook safely, met up with Pete, visited the site of their new mansion, got a little history of the area, ate a steak dinner, and threw some dice. I did pretty well but, unfortunately, Pete wasn't fairing as well. He's more adventurous which paid well in the beginning, but later took advantage of his winnings. We later tried to gamble for a "good story," but unfortunately the story didn't pan out. Special thanks to Pete and all the Adanalians for being so hospitable. Pete, dressed appropriately for his boat on Lake Tahoe. Stay tuned for the next post featuring the drive to the great city of Las Vegas.